A lot of people seem to think cats cannot be trained. Before I had my own cat, I never really thought this through, but since the only cats I’d ever met were allowed free-reign over their households, permitted to do whatever they pleased, I would’ve expected the statement “Cats cannot be trained” to be true. It isn’t. 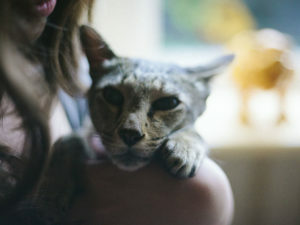 Cats can be trained – and in my opinion you’d be hard pressed to find a kitty that’s incapable of being trained at all. Obviously, I have to qualify my statement now. I’m talking basic training here – not Golden Retriever levels of tricks. Clearly, cats cannot be trained to the extent service dog breeds can – there’s a reason we use these dog breeds for assisting humans and it’s not because they happen to be taller or more friendly than cats. So what type of training am I talking about? Little life-enhancement tricks like: recognizing his or her own name, sitting, staying, coming to a room when called, and being fine with being picked up; as well as training that will stop the repetition of specific undesirable behaviours: like jumping up on counters, scratching up furniture, running away from humans, and consistently begging for food. Now that we’re on the same page about what I mean when I talk about training cats – if I’m right and it is actually possible to train nearly every cat to do those types of things, why aren’t there more trained cats out there? I’m betting on two reasons: cat owners typically either don’t care to train their cats, or they don’t bother trying. If you don’t care to train your cat: I’m here to show you a few reasons why you might want to change your thoughts on that matter, at least with regards to a few key behaviours. 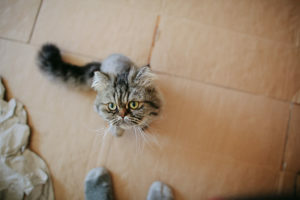 If you have thought about training your cat but haven’t bothered trying – hopefully outlining these reasons will give you the kick in the pants you need to get going. I have plenty of how-to guides outlining specific behaviours you can train your cat to do and not do, so the “I don’t know where to start or how exactly to do it!” excuse is no longer going to cut it. 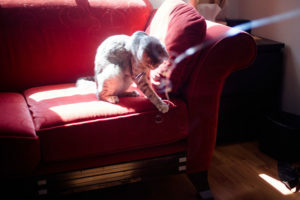 Now let’s get into the meat of this article: why I think it’s incredibly important to train pet cats to do (and stop doing) at least a few key things. Ah the ol’ cat-being-wherever-he-pleases life. I’m sorry to say, for health and hygiene reasons, I’m genuinely not about it. Why? It’s simple: there are many times my cat will not clean himself directly after a visit to the kitty restroom. Not too big a deal, except – there are also many times I won’t remember or bother to clean off kitchen counters right before my husband cooks. Recipe for a hygiene disaster? Probably. You just never know. If my cat wasn’t trained to stay off the kitchen counters, I’d at the very least be pretty paranoid about religiously cleaning the kitchen counters before cooking and eating. Imagining bathroom bits Avery might otherwise be leaving on our counter-tops, and our failure to clean those off before we cook is a bit of a nightmare. Speaking about the health-related dangers of cats being up on counters – it’s probably a lot safer for cats to not be allowed up on counters for their own health and well being as well. I’m sure you’ve already guessed why. As careful as we try to be as pet owners not to leave foods out, we’re human, and so sometimes – we just plain forget. There are plenty of human foods cats should not at all be eating. 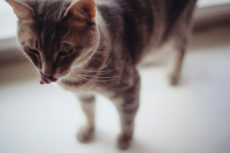 Foods that are poisonous and can lead kitty to need an emergency trip to the vet if kitty gets his or her paws on them. Many of these foods we might not even realize are dangerous. Take chocolate for instance. Obviously, you probably already know to keep dark and milk chocolates away from your cat, but did you know white chocolate is also toxic to felines? Leave a bowl of white baking chocolate out and take a washroom break only to come back and find your kitty on the counter taking a nibble, you’ll need to first hide that bowl from the rest of your cats, then be off in your car for an urgent vet visit. Not pretty for kitty and not fun for mum. Counters and dining room tables are the easiest places to forget food out on. 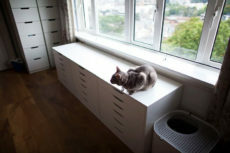 If you train your cat to stay away from these surfaces, not only will you not have to worry about potentially ingesting bathroom bits your cat leaves, you also won’t have to worry so much about the potential of your cat eating human foods he or she shouldn’t that have accidentally been left out. 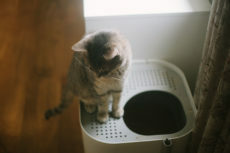 Of course, training a cat to stay off of food-friendly surfaces does not mean you should be any less careful about leaving toxic-to-kitty food on the dining room table or counters – it just means that when accidents happen, and we all know they do – your cat stands a much higher chance of staying safely at bay. When we first took Avery in, I was more than a little concerned over his stereotypical cat behaviour of rushing to hide beneath a bed whenever he was a little anxious or stressed. 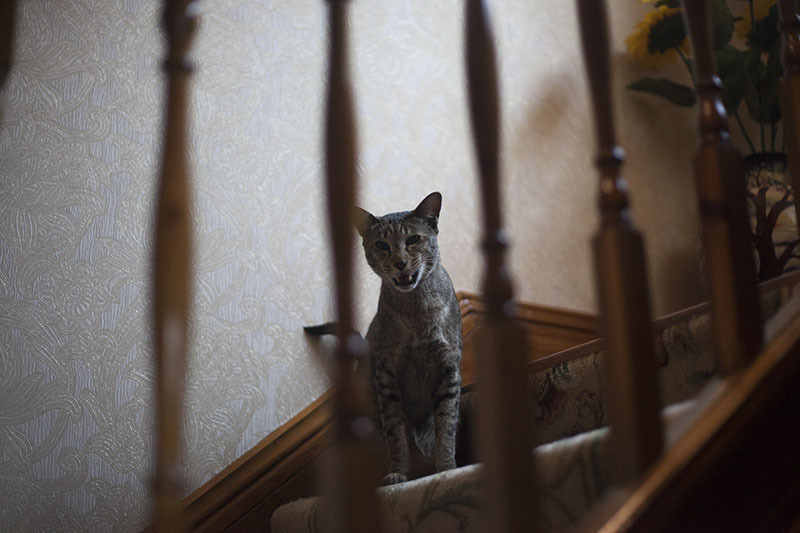 The behaviour nagged at me unrelentingly because I couldn’t quit imagining if there ever happened to be a house fire, he’d run beneath a bed, Thomas and I wouldn’t be able to get him out quickly enough, and we’d have to evacuate our home without him – the most horrific thing I could imagine as a new pet owner. So began to train Avery never to go under the bed. I still do my best to stuff things beneath beds that don’t touch the floor when I can, making it difficult for him to find space to hide underneath so this common cat habit doesn’t eventually re-emerge, but I firmly believe training a cat to quit hiding beneath furniture, and instead, to choose a more human-accessible space like a cat bed or tree, is probably the single most important thing I could’ve trained my cat to do. Stop running away from humans. Be okay with being picked up. Stop being afraid of his carrier. Be alright with being walked around with (while in his carrier) for a considerable amount of time. Be alright with being driven around with (while in his carrier) in a car. In the unlikely case there’s ever an emergency at home, I now have the peace of mind that I will be able to quickly and easily get a hold of my cat and go, and that he won’t be anxious or upset when I do have to get him out and away from the house. 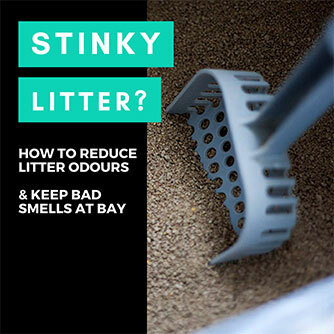 If you’re not okay with your cat scratching up your furniture – you should not feel bad about this! Some furniture pieces can be sentimental (especially when they’re antiques, came from beloved family members, or just happen to be pieces you love!) and it can be heartbreaking to watch a cat take his or her claws to these pieces. Other times, you may just find yourself wishing the furniture you bought new last year looked a little more like you bought them one year ago and not a decade previously. These feelings aren’t bad or mean to cats! 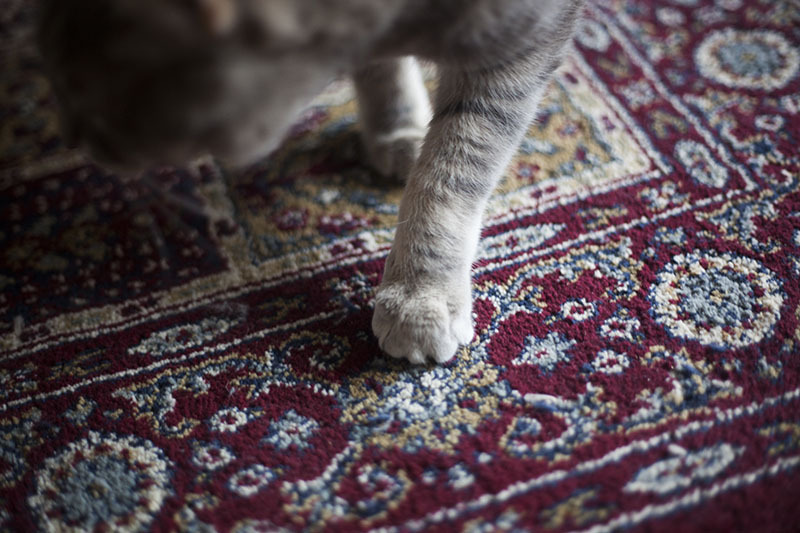 For your sanity – for your happiness – for your peace of mind: these are all good reasons to train a cat to stop scratching furniture. You shouldn’t have to put up with a behaviour that a cat realistically doesn’t need to be engaging in to stay happy and healthy. Scratching is a requirement of healthy feline life. Scratching furniture you don’t want scratched, is not. 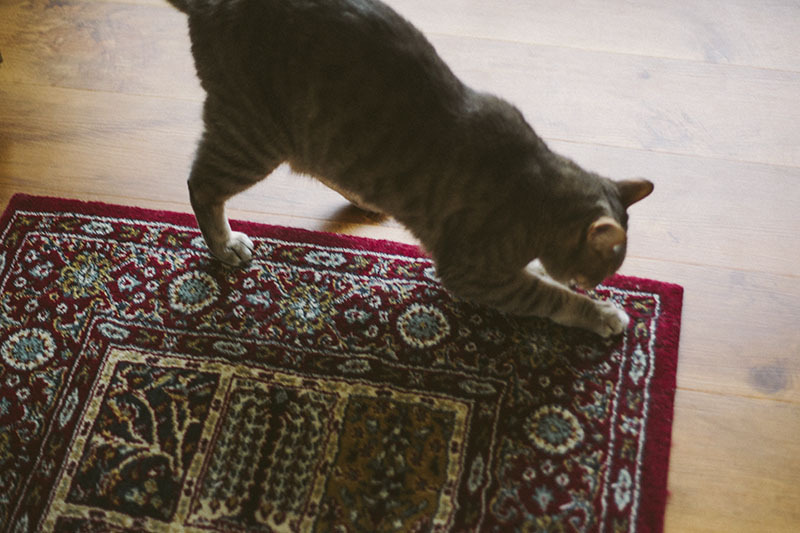 You can train your cat to stop scratching things you don’t want scratched quite easily – it involves offering up plenty of other human-approved scratching things, and if you’re curious about the full process, you can read about how to do it here. You can also train your cat to stop doing other annoying things: like waking you up earlier and earlier each morning, and begging for food consistently, and it’s my firm opinion that you’re not at all a bad pet owner for thinking about doing this. Your cat needs to scratch, but doesn’t need to scratch up things you don’t want scratched up. 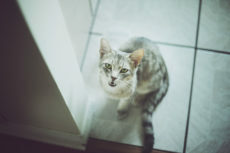 Your cat needs to eat, but it’s not necessary for him or her to beg you incessantly for food. If you don’t like these behaviours – it’s not wrong or mean for you to train your cat out of them for your peace of mind! I firmly believe that a happier pet parent makes for a happier household, which ultimately makes for a happier pet. So not only would you be doing yourself a favour by training your cat to stop doing things that grate on you day after day, you would also be doing your cat a favour indirectly. If you spend your days annoyed about a specific thing your cat does (wake you up at ungodly hours in the morning, destroy your home, etc. 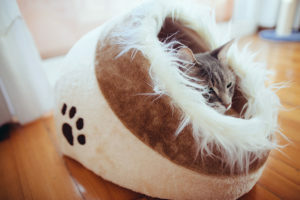 ), it could lead you to build up some resentment toward your cat – and that’s not an ideal environment for your cat to be living in. You being miserable is going to eventually lead your cat to be unhappy, too. No feline deserves to live with a pet parent consistently annoyed or angry at him or her. Save your cat the trouble and resolve behavioural issues you’re frustrated by before that frustration escalates into harboured negative emotions. You might think this one is a stretch, but I don’t. I wholeheartedly believe that much of the worry and concern and hesitation new pet owners have over taking in their first cat has to do with the fact that these would-be pet owners fret over dealing with a lot of the cons/”negatives” of cat ownership: things like having their clothes and furniture scratched up, hygiene concerns over cats jumping on counters – mostly all habits I’ve already explained can pretty easily be trained out of a cat. 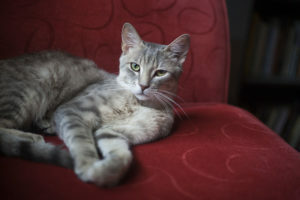 If there were a lot more pet owners training their cats to do things that would improve the quality of human-and-feline cohabitation, I think there would be a lot more would-be pet owners making the leap into cat ownership – since they wouldn’t perceive there being so many downsides to having a pet cat. 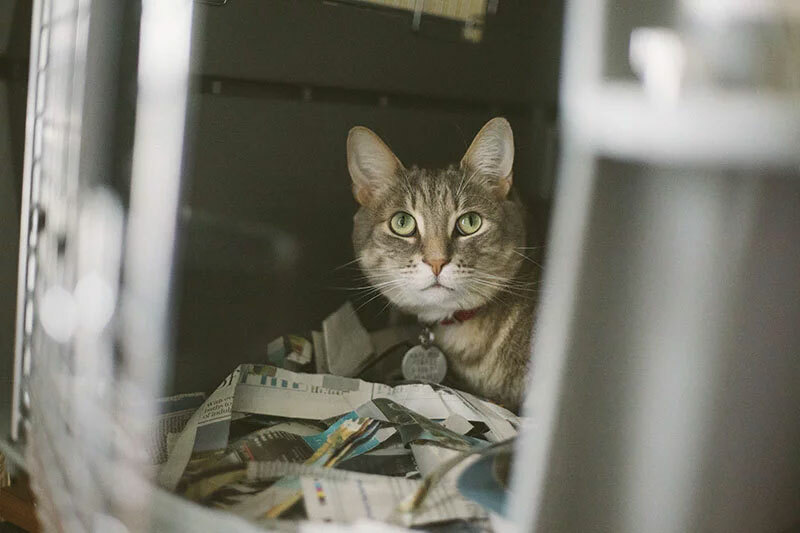 More cats being adopted out of shelters and taken into good homes: isn’t that what we-who-love-cats-so-much want so badly at the end of the day? What Do You Think About Training Cats? Now it’s your turn. Do you think the case I made about the importance of training cats is strong? Do you think it’s ridiculous and cat owners shouldn’t bother with training cats because they don’t actually need to? What did you think about training cats before you read this article? What do you think about training cats now? 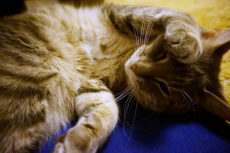 Have you ever trained a pet cat to do something or to stop doing something? Have you ever wished that you could? What behaviour did you want to change? I agree that training in some cases is good , especially for the cat’s safety. I think that’s the one area that means the most to me, especially when it comes to emergencies. OOOHHH! I bought a clicker, and I want to start working with the cats, but I’m intimidated beyond belief! If there were a cat training class I could sign up for, I’d do it in a heartbeat. Manny and Chili Bruce are maniacs; they need to curb their jumping up for the food bowls as I carry them. Angel is so anxious about the boys; I believe training would help her calm down! But…I’m stuck. I don’t use clickers, though I’ve heard they’re really helpful! Whenever they jump, say “No” and (if you were walking) stop dead in your tracks until they’ve settled down enough that you’re satisfied and stood still. Continue to walk only when they’ve settled down for around 5 seconds at minimum. Any time they jump, repeat “No” and stop again. Rinse and repeat until you’re where you need to put down the food bowl. Only put down the bowls after around 15-30 seconds of neither of them jumping at all, so they will eventually correlate jumping with longer wait times for food.